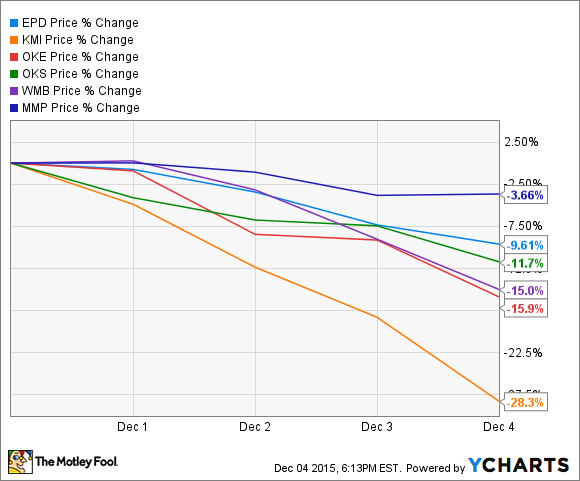 The week of Nov. 30 was pretty ugly for energy investors. Should investors stay away, or get greedy? "The time to buy is when there's blood in the streets. Even when the blood is your own." Is it time to buy, or is there still more bleeding to come? Let's take a closer look at last week, and what the future may hold. While all of the major indices, including the Dow Jones Industrials and S&P 500, were up strongly on Friday to put the market up for the week, the energy sector really took it on the chin. Oil and natural gas prices both fell to close the week, ending up about where they were one week ago as global demand growth remains stagnant while the market remains oversupplied, with even more potential supplies in the Middle East set to hit the market from Iran early next year. 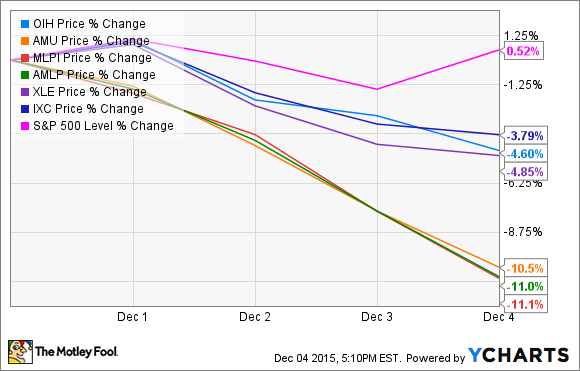 But that's only part of what pushed energy stocks (and the ETFs that invest in them) down this week. An article in Barron's put a spotlight on midstream giant Kinder Morgan (NYSE:KMI), following the company's investment in an increased stake in struggling pipeline operator Natural Gas Pipeline Company. Credit rating agency Moody's cut its outlook on the company from "stable" to "negative" but didn't take any action on the company's credit rating, But the Barron's article, with the headline "Next Stop: Junk Bond Status," painted an ugly picture for the company, including a scenario where the company is forced to cut or even halt its dividend. Kinder Morgan issued a press release before noon ET Friday in an attempt to assuage investors, saying that its $5 billion-plus in expected distributable cash flow in 2016 would be more than sufficient to cover its dividend. The release also said that management could use some of that cash to meet the company's equity needs, leaving the door open for a flat dividend, or even a potential (if unlikely) cut. That's a big, fat "ouch" for the midstream segment. Pipeline operators such as Kinder Morgan, ONEOK (NYSE:OKE) and its MLP ONEOK Partners (NYSE:OKS), Magellan Midstream Partners L.P. (NYSE:MMP), Enterprise Products Partners L.P. (NYSE:EPD), and Williams Companies Inc (NYSE:WMB) typically generate the majority of their income from fee-based contracts, insulating them from swings in oil and natural gas prices. However, volume is an important part of their business, and there are real concerns that U.S. oil and natural gas production is set to decline over the next year, and that could hurt cash flows. Factor in the capital structure of most midstream operators, which use debt and stock sales to fund growth while returning excess cash flows to investors via dividends, and Mr. Market is fearful that this segment may be weaker than most people think it to be. That's playing a role in the decline of all of these stocks now -- but it's probably not the only thing going on. End-of-year selling playing a role? The rest of the market performed strongly on Friday and was slightly up for the week. 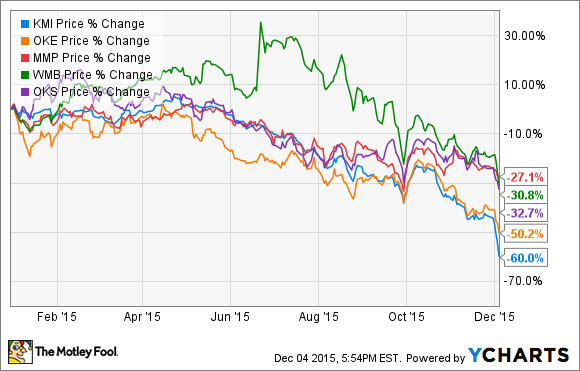 Energy stocks -- including the midstream segment -- have had a terrible year. It's near the end of the year. Add it all up, and it's likely that the fears about 2016 for the entire midstream segment, and the negative press around the industry gorilla, Kinder Morgan, compounded things in a market that was already set to sell off at year-end. Looking ahead: Falling knife or time to get greedy? It's been an ugly year-plus to invest in the energy business, with every major energy ETF down more than 16% so far. The thing is, things could get worse before they turn. Oil and gas prices are still well down, and it's unclear if global producers are ready to finally take their foot off the production pedal. But investors with a long-term outlook and a willingness to ride out at least another year of uncertainty, could do worse than investing at these levels. The recovery hasn't started yet, but the oil and gas industry isn't dying so much as it's drowning itself in oil. Equilibrium will return, and the best companies will do well. As to which ETFs to invest in, I'd suggest the Energy Select Sector SPDR and iShares S&P Global Energy Sector ETF, because of their lower cost structure versus the midstream ETFs and broader exposure. If you're interested in midstream investing, you're probably better off buying shares of several of the top companies in the space, including ONEOK and ONEOK Partners, Magellan Midstream, Enterprise Partners, and even Kinder Morgan. It shouldn't be dismissed out of hand, but I think the Barron's article overstates the risk for long-term investors.